Chilean mesquite | Infonet Biovision Home. It is native to Argentina, Chile, Peru, and Uruguay but now is cultivated all over the tropics. In Kenya, it is distributed in Baringo, Wajir, Magadi, Mandera and Turkana. Since the tree has become a weed in wetter areas, planting in cultivated areas should be avoided. There are about 44 mesquites, most of which are found in the warmer parts of the Americas and a few in Asia and Africa. A number of them are terrible weeds. 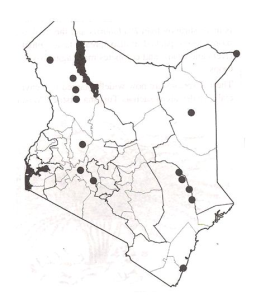 Prosopis .spp, generally referred to as mesquites, have demonstrated their invasiveness in Kenya especially in irrigation schemes in hot areas. Prosopis is drought resistant and grows on sandy to sandy-clay soils to riverine clay/ sandy soils. It is tolerant to extreme temperatures, severe drought, overgrazing and waterlogging but is sensitive to weed competition while young. It does well in altitude ranges of 0 to 1,500 m above sea level. It does well in agro-ecological zones IV - VII. 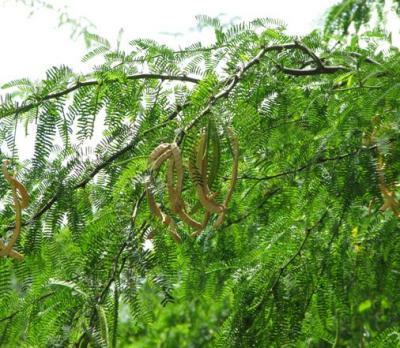 Found in Enrichment/ agroforestry systems, prosopis can be propagated by seedlings or direct sowing at site. They are fairly fast growing even in dry conditions. Coppicing and pruning can be employed in management. Leaves and pods can be lopped for goats. Food: The pods are eaten by the native people (Northern Argentina), especially as ground flour. Fodder: The pods and not the leaves are readily eaten by livestock. They have as high as 35% sugar content and contain 10 - 12% crude protein. Seeds are sometimes ground in a concentrate for animal feeds. Large trees, 40 cm in basal diameter and 7 m in canopy diameter, may produce 40 kg of pods under optimal condition. Apiculture: P. chilensis is a good source of nectar and pollen. A pale amber-coloured honey of medium density and good flavour is produced in abundance. Its flowering season is short and therefore it is not able to support a large swarm of bees throughout the year. Fuel: When burnt P. chilensis ignites readily, has a high calorific value, emits intense heat, makes enduring embers and leaves little ash. The wood makes good charcoal and could be exploited commercially to supply industrial and domestic demand using portable kilns. Fibre: Wood yields sulphate pulp for writing and printing works. Timber: P. chilensis wood is relatively dense (about 700-800 kg/m3). It is valued for furniture, doors, cobblestones and parquet floors. The wood has a low olumetric shrinkage hence joints in furniture have much less tendency to open during conditions of changing humidity. Gum or resin: The bark exudes an amber-coloured, translucent gum similar to gum arabic used in mucilage and an ingredient in medicine. Erosion control: It is good for erosion control and soil stabilization in arid lands, due to its deep rooting habit. Shade or shelter: When planted as a hedgerow provides shade for fruit trees, field crops and to the homesteads. Nitrogen fixing: P. chilensis is able to fix atmospheric nitrogen in its root nodules because is a legume. Ornamental: Due to its broad, rounded, open head of bright green foliage supported by gracefully arched spineless branchlets, its rapid growth and large size, P. chilensis can be used as an ornamental tree. Boundary or barrier or support: P. chilensis could possibly be used to an advantage as barrier plant to form stock-proof hedge row given its spines. Oncideres spp., a twig girdling insects causes minor damage to mathenge. Though not yet un-described, there is a disease which causes the terminal shoots to die. This necrosis gradually spreads downward and eventually kills the entire tree.